Some schools specialize in producing players at certain positions. Sometimes its defensive backs, other times its running backs, and others even come up with great linemen. The position of quarterback is one that a few HBCUs have had a lot of success with over the years. We’re taking a look at which HBCUs consistently produce solid talent in the quarterback position, whether they are dual threats or drop backs. Alcorn State certainly fits that description. When you mention quarterbacks and ASU, obviously one name comes to mind for most football fans. But there is a great history of producing signal callers that keep the SWAC up at night. While the nickname “Air” is almost universally synonyomus with his younger sibling, the current Alcorn State coach was the first to bear the name. After starting his career as a wide receiver in the mid-1980s, he switched to quarterback as a junior. He went on to finish fifth in Division 1-AA in passing efficiency his senior year and was named to the All-SWAC second team in 1989. He went on to have a pro career in arena football that spanned a decade as he completed over 57 percent of his passes, while throwing for 16,591 yards and 291 touchdowns. 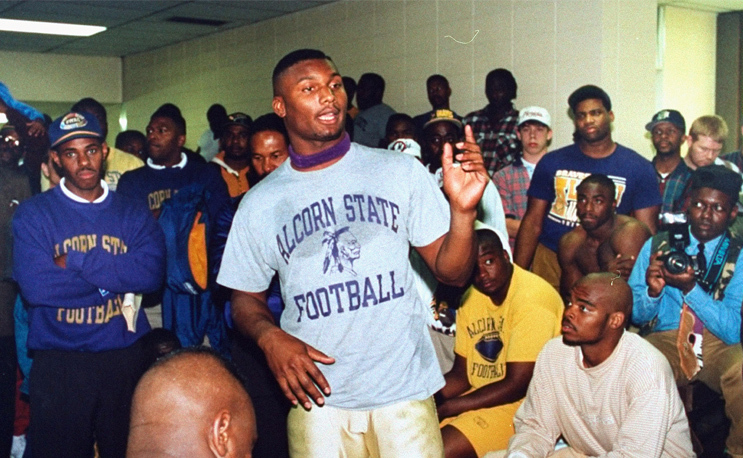 The younger McNair arrived in the shadow of his big brother, but he quickly made a name for himself as the greatest passer in SWAC and HBCU history and arguably one of the best to ever play college football. He won SWAC Offensive Player of the Year as a freshman and kept the award for his entire four year career. His senior season stands as one of the greatest in college football history nearly a quarter century later, as he gained 6,281 combined yards rushing (904) and passing (5,377), along with 56 touchdowns while leading his team to the SWAC title. He finished fourth in the voting for the Heisman Trophy, and won the Walter Payton Award for the top FCS player. McNair finished his college career as Division I-AA (now FCS) all-time leader with 14, 496 yards passing (just topped in 2018) and 16,823 total yards. He would go on to be selected third overall by the Houston Oilers in 1995 and would later lead the franchise to the Super Bowl and win NFL co-MVP honors in 2003. A tall (6’6) gifted athlete from Houston, Gibbs came into his own after Fred McNair joined the staff as quarterbacks coach at his alma mater. During his sophomore and junior seasons, passing for better than 5,000 yards while rushing for nearly 1,500. His junior season was one for the books as he rushed for 1,006 yards while leading Alcorn to its first conference title since the McNair days. He passed for 7,451 yards, 57 touchdowns during his career, and would have improved on those numbers if not for an injury that sidelined him for most of his senior season, leading the way for the next guy on the list. Footman wasn’t supposed to succeed Gibbs until 2016, but when an injury sidelined the reigning SWAC Offensive Player of The Year in late 2015, he sprang into action. He lit up Southern for 274 yards on the ground, then led ASU past Grambling for the SWAC title before he nearly engineered a comeback in the inagural Celebration Bowl. Footman’s last two years didn’t result in more SWAC titles or Celebration Bowls, but the team did win two more SWAC East titles. He also improved as a passer, becoming a true dual threat by the time he finished his career in 2017. He threw for more than 4,000 yards and ran for nearly 2,000 while coming up with 51 total touchdowns. Johnson was also on the 2015 SWAC Champ/Celebration Bowl squad, but he suited up for two games and was redshirted that season. He saw limited action the last two seasons, throwing 15 touchdowns while spelling Footman. He was handed the reins to the offense in 2018 and responded with a season to remember, throwing for 2,207 yards and rushing for 1,080 while leading the team to another SWAC title game and another Celebration Bowl berth. With Johnson and much of his offensive crew coming back, ASU will once again be a team to beat in the SWAC.